The Petsafe Staywell Original 2 Way Pet Door (Large) has been designed for larger breed dogs weighing up to 45kg to allow your dog to come and go as they please when you’re not at home. 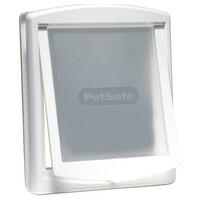 The Original Pet Door is easy-to-fit and has been made out of a tough, easy-to-clean thermoplastic. It can be set to 2 different settings: Locked or Open.